The game of Bingo is one that has a long history in Western culture. Its great success and penetration of modern culture can be followed back to centuries before our time where a similar system of play was already being used. Bingo is essentially an offshoot of other games of chance but can be traced back most directly to the Italian game of Lo Giuoco Code Loto which was popular in the 1530s. It evolved in 18th century France where the familiar traits of reading out random numbers and players having cards to keep track of their game emerged. The German educational system saw the game adopted as a method of teaching children a variety of subjects and enjoyed success through the 1800s. 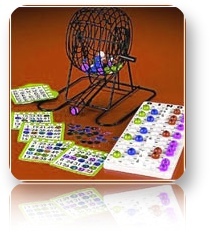 It is in the United States that we saw the familiar, North American form of Bingo take shape however. It is said that a carnival visitor named Edwin Lowe watched the similar game of Beano being played in 1929 Atlanta and was struck by the level of engagement and involvement of players who only gave up the game after being told to leave at three o’clock in the morning. Lowe showed the game as he remembered it to friends in New York wherein beans, numbering stamps and playing boards were used. The name of his new game is said to have originated when an excited friend called out ‘Bingo!’ instead of the proper name (Beano) upon winning a game. Lowe was met with great success when he began to spread the game further and by the 1940s the style of play had spread all across the country. As time continued the relatively easygoing game of Bingo became popular as a method small-stakes gambling that could be used for charity auctions and other similar events. In the United Kingdom, Bingo (also called Housie in Australia and New Zealand) was played similarly but with slightly different structure. In Great Britain and areas touched by its sphere of influence, Bingo spread alongside its American iteration and helped to become a worldwide phenomenon. A gambling card game also developed inspired by Bingo (taking the same name) because of an existing style of play that bore similarities to Lowe’s popular game. With advancements in technology, the game of Bingo has progressed as well. Rather than different methods of calling (such as marked balls in a spinning wheel) computerized versions of random number generation have been put into place further reinforcing legitimization and lessening any chances of foul play. Online games of Bingo have also become popular in recent years either for fun or betting, the format of the game lending itself easily to the internet and remote play. Given its simple rules and addictive play Bingo can be seen as a pastime that is firmly emplaced as an incredibly fun and easy institution in the world of gaming. When looking back at its history we can note the prevalence of Bingo as a tool for gambling, learning or pure entertainment and there is no doubt that it will continue to thrive in future generations.